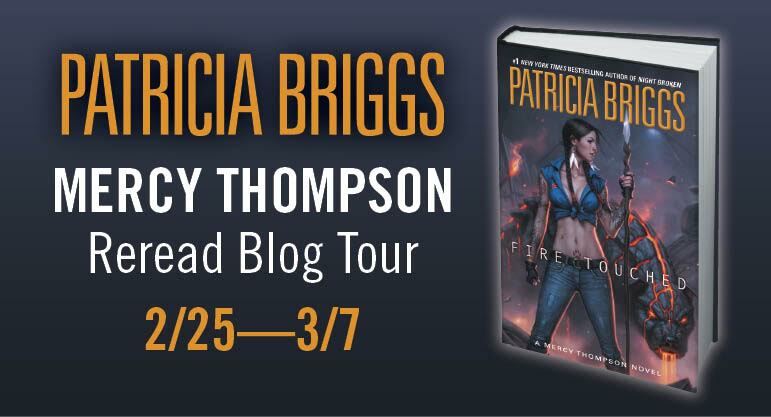 Mercy Thompson Reread: River Marked by Patricia Briggs & GIVEAWAY! Fire Touched is almost here! To celebrate, I’m very excited to be taking part in the Mercy Thompson Reread Blog Tour leading up to the publication of the ninth volume of the series. I was even more thrilled when I found out I would be covering my first choice of the available titles–the sixth book, River Marked. As one of my favorite Mercy Thompson books, this particular story has stayed closed to my heart even though it has been a few years since I first read it. Needless to say, I had a lot of fun revisiting it, and the second time around was just as awesome. If you haven’t met Mercedes “Mercy” Thompson yet, you’re in for a treat. She’s one of the coolest and most capable urban fantasy heroines I’ve ever encountered. As the owner of an auto-shop in the Tri-Cities area of Washington, she makes a living by fixing Volkswagens and rebuilding vintage cars for sale. In her private life though, she hangs out with vampires, werewolves and fae. Mercy herself happens to a Walker, able to shapeshift into a coyote at will, a power she inherited from her father who died before she was born. Until now, she thought she was the only one of her kind. But in River Marked we find out this is not the case. After their wedding, Mercy and Adam, the alpha of the Columbia Basin werewolf pack, make their way into the wilderness for their honeymoon in a pimped out fae-borrowed trailer, hoping for some quality alone time in a nice quiet retreat. As usual though, nothing in Mercy’s life ever goes as planned. In the depths of the Columbia River, an ancient evil has awakened and is killing innocent people. Mercy also encounters other walkers for the first time, magical humans like her who can take the form of other animals. ~ There were so many great moments in this book, but nothing beats Mercy and Adam finally tying the knot. All their friends and family come together to throw them a “surprise wedding”, playing their roles marvelously as not to alert the bride and groom. As book weddings go, this was one of the best and most memorable. It manages to be sweet and romantic without following any of the conventions, and it’s also touching because it involves all of the couple’s loved ones. I think I like this wedding scene even more the second time around, though I still lament the fact that it was over way too quickly. ~ Honeymooning by camping on the banks of the Columbia River. I love this because it’s just so Mercy and Adam. I can’t picture these two staying at some cushy hotel. Plus, the circumstances were rife for plenty of cute moments. Adam can be overprotective of Mercy to the point of extreme, but there’s no question that he really loves her, and she loves him. 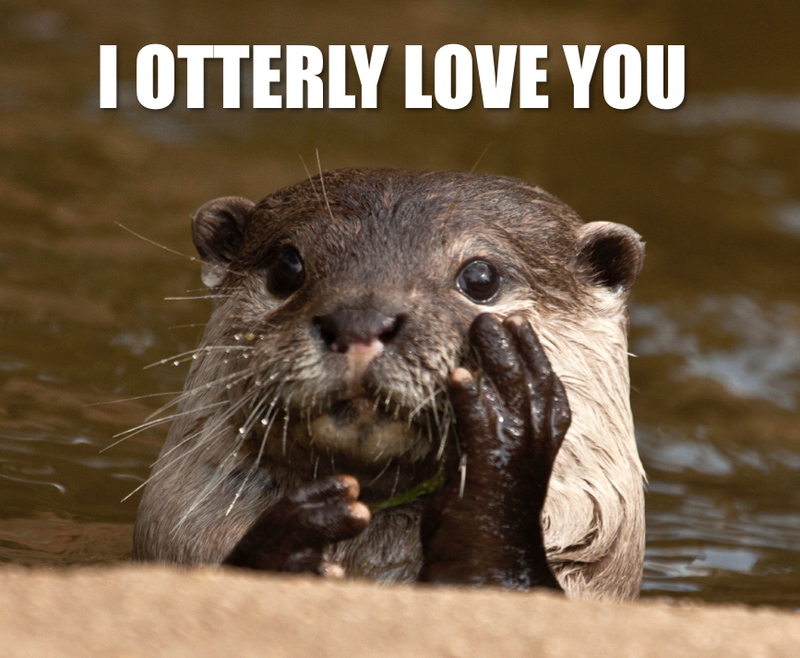 ~ The otters. That is all. ~ The encounters with Coyote. In particular, there was one quiet, introspective conversation between him and Mercy by the river that revealed a lot about her roots, and answered many questions about her father. But watch out! They don’t call Coyote a trickster for nothing. ~ The final showdown with the river devil itself, which made all the mystery and suspense worth it. ~ And of course, Mercy’s letter to Adam at the end of the book. All I can say is, wow. All the feels. Words cannot describe. A lot of people I know who read Mercy Thompson say that River Marked is their least favorite of the series or that it is weaker than many of the other novels…but I can’t disagree more! Sure, it was a little slow to start, but once it the story grabbed me, it grabbed me hard. I felt the series needed this book desperately, for several reasons. First of all, Mercy and Adam get married, putting an end to the tensions and drama between Mercy and other potential suitors for her ONCE AND FOR ALL. I also understand that folks might be disappointed that we don’t get to see much of the supporting cast (because granted, they are part of what makes this series great) but personally, I liked that Mercy and Adam finally got to have their own adventure without interference from the wolf pack or vampires. For this reason, I also felt that River Marked contains the most “stand alone” story line of all the books. Furthermore, River Marked is an important turning point for Mercy’s character growth. She went through some terrible things in the previous books, and this was a good story for her to look towards the future and start a new chapter in her life. She and Adam get to grow closer, adjusting to each other’s strengths and weaknesses, learning to live together and trust one another. As well, it was high time that her own powers were explored, and for the first time, we got a book completely devoted to Mercy’s heritage. Brigg’s inclusion of Native American mythology and their spiritual stories made this one a fascinating read (and reread)! Have you read the Mercy Thompson series? Do you have favorite book? What did you think of River Marked? How excited are you for Fire Touched? Interested in winning a copy of this book? For this blog tour, the publisher has very generously offered The BiblioSanctum an opportunity to host a giveaway of my chosen Mercy Thompson title! 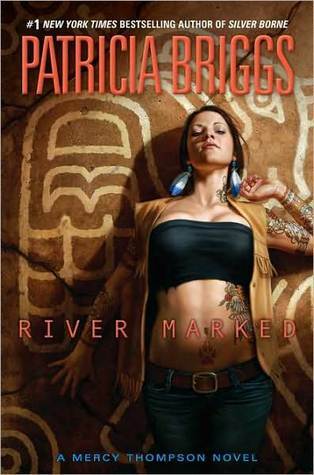 Here’s your chance to win one of two print copies of River Marked by Patricia Briggs. This giveaway is open to residents in the US. To enter, all you have to do is send an email to bibliosanctum@gmail.com with your Name and valid Mailing Address using the subject line “RIVER MARKED” by 11:59pm Eastern time on Sunday, March 13, 2016. Only one entry per household, please. The two winners will be randomly selected when the giveaway ends and then be notified by email. All information will only be used for the purposes of contacting the winner and sending them their prize. Once the giveaway ends all entry emails will be deleted. I love the series. I would love to win because I’m having to rebuild my library. Thank you for the chance. so many great moments! I really loved all the books!!! I got hooked on the series from River Marked. I thought the cover was cool so I bought it fell in love with Mercy and bought the rest. I have reread the series so many times. Can’t wait for the next book. The covers area really beautiful – I love how every one of them shows off Mercy’s awesome tattoos!